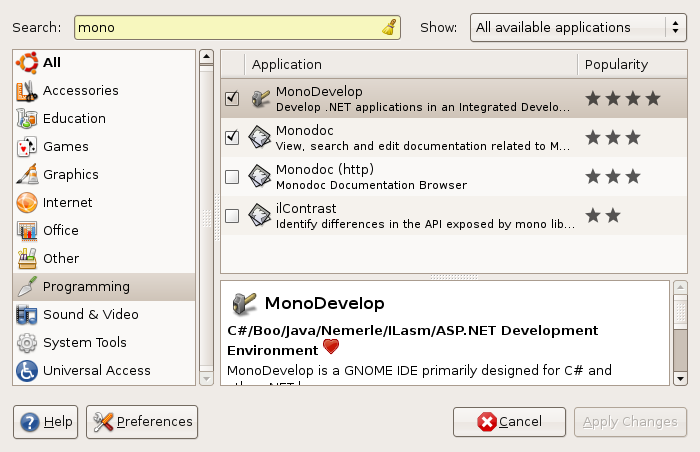 Mono under Ubuntu (Gutsy Gibbon – released in October 2007) is a good combination so I decided to try it.I will describe quickly the steps that you need to do in order to have Mono environment running. Download the last Mono version(1.2.6) from here.You will need the Linux Installer for x86 at the bottom of the page.After downloading it you just have to click twice and it’s automatically started. In order to make aspx pages to work we have to configure and test the xsp2 web server.Detailed description that I followed can be found on Timani’s Blog. You will need the MonoDevelop (1.8.1) environment for writing and testing applications.I find a good detailed installation guide from the How to Geek.You can follow the commands and install the last version. After playing around I saw the Add/Remove option in the Application menu in Ubuntu.The easiest way to install Mono and MonoDevelop is to go in Application-> Add/Remove then you choose Programming and just write in the Search menu above “mono”.Then you have to think/enable the mono and monodevelop installation and that’s all. 🙂 The only problem is that it’s not always the last version. This entry was posted in Mono, Software, Ubuntu and tagged Mono, MonoDevelop, Ubuntu on January 4, 2008 by Todor.